Cleveland Browns veteran Joe Thomas is #blessed. That's because he was named the "first offensive lineman in NFL history." The Browns player posted a screenshot of the TV mistake to his Twitter account Friday with the caption #blessed. The team quoted the tweet with their own caption: "wow, congrats." 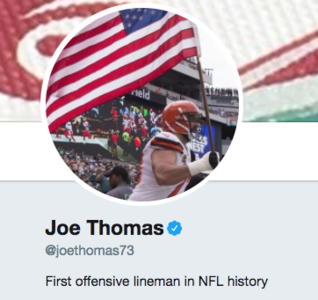 Thomas embraced the title, even adding it to his Twitter bio.